Bear market (red over dark green). 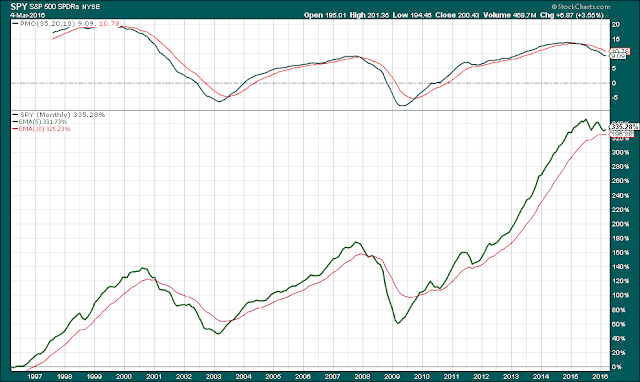 The light green line has come a long way up, and the dark green line is beginning to turn up, perhaps the end of this sell off. Bear Market = Bearish outcomes. In the right side highlight we see green is above yellow. 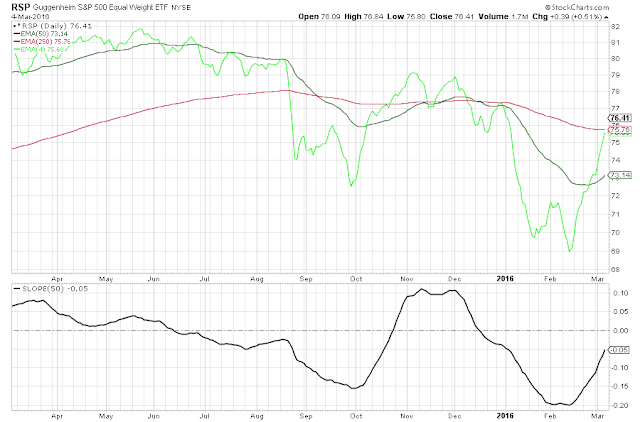 Breadth issues are drying up, the sell off may be over. Obviously – 5 white bricks trend is heading up. Pros are with the market volume jumps! VIX is the fear gage .. below 17 is calming but still in the dangerous zone. Now 83% of stocks are above their 50day MA. 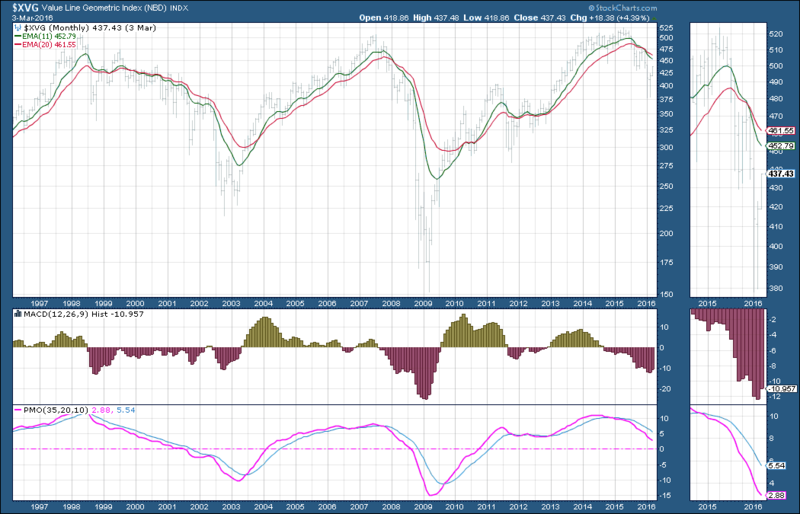 However top window shows a MACD near top. 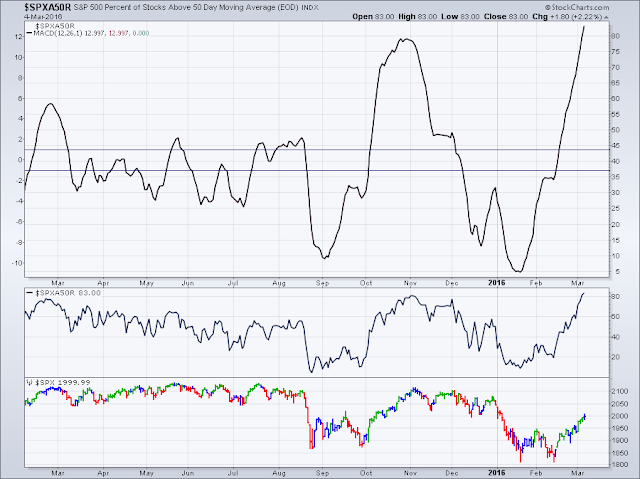 Looks way overbought, expect market to fade in coming days. Be ready to go deeper short. Consumer stumbles watch out. Bonds are fading. Consumer is fading watch out. What I Find Interesting This was an interesting article in the Vancouver Sun about a money laundering via real estate. 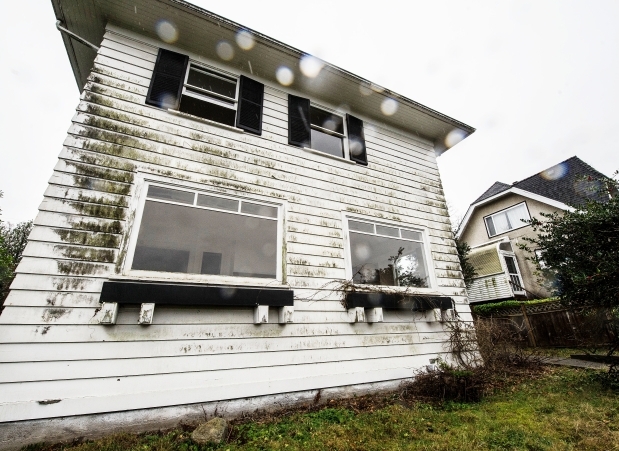 This Vancouver home sold for $7.2 million to off shore Chinese investors. They make "all cash" purchases, usually sight unseen, using lawyers, numbered companies, third parties intermediaries to preserve their anonymity, or directly in favored cities like Vancouver, New York, London or San Jose/San Francisco. Gold with the ticker:GLD ETF and ticker:DEF an ETF of stable defensive stocks. Several people have been asking what happens next? Well of course no one knows with prefect certainty but I can show you some charts and some rules of thumb and you can see how I came to my guess. 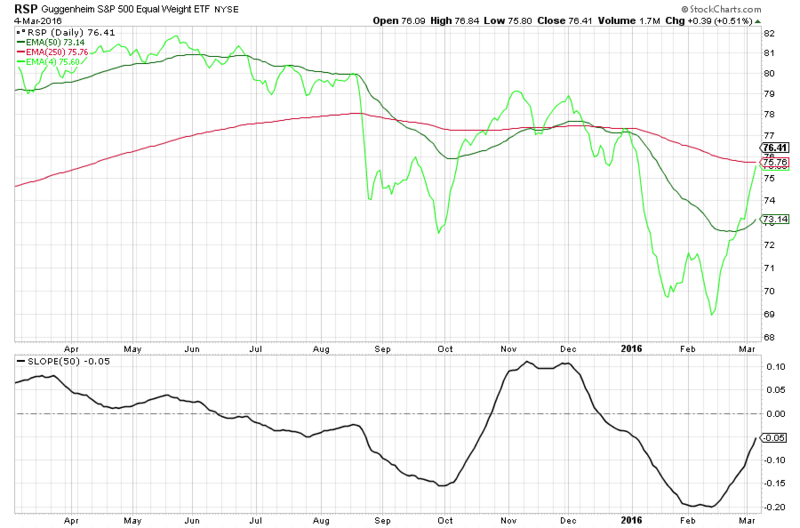 Right off we know the problem, the bull bear lines are dark green over red, saying this is a bear market. Bear market means expect bearish outcomes. 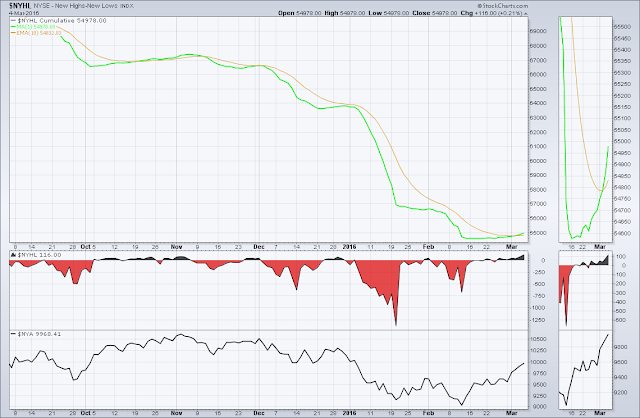 Now the light green short-term line says we are half way recovered, so that is an impressive rally. Our daily price even passed the 200 day moving average. That says not to be overly pessimistic, and to be at least part in cash and do not mess with leverage, its just too dangerous. This is a short squeeze, people are selling to cover and those can rip your face off. Moving on lets look at another big picture chart, this one is the really big picture PMO chart and what is says is for the first time in 7 years we have a real chance of a secular long term bear market. You must respect this, this is no time to try and scoop a bargain on a high flyer like buying FaceBook or Amazon. Next we have the Value Line Geometric Index chart one of the best long term gauges showing no sign of recovery yet. Our OBV chart was lagging but now volume is catching up so that says the smart money is covering. 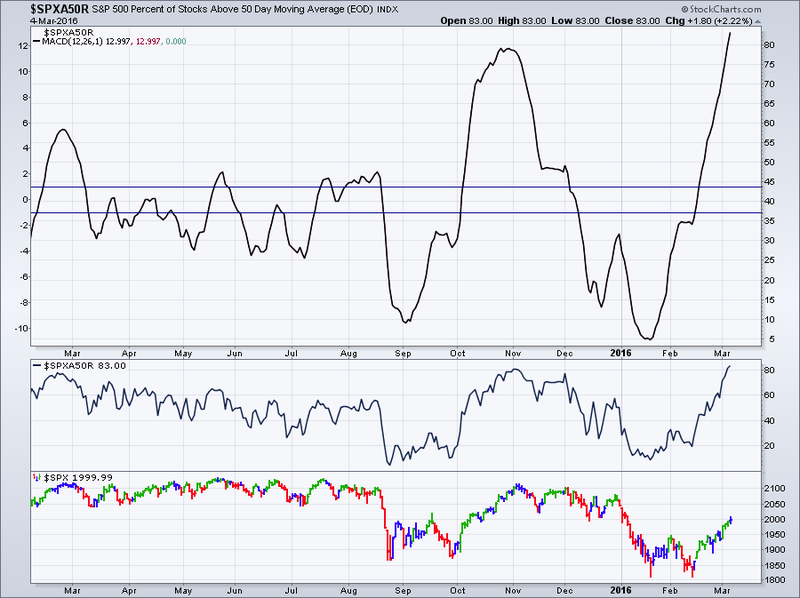 We also see by the percent of stocks over 50 chart has hit 80% and the MACD (top line) is in nose bleed territory. It says that this recovery may be unsustainable and that we are be overbought. Against this we have some short-term signs of a strong recovery. 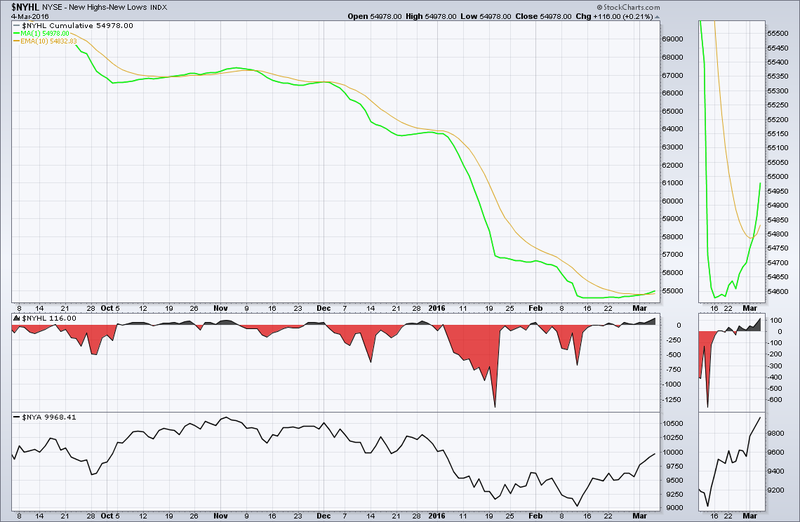 Here we see green and yellow have crossed on the NYSE over 52 week high low chart. That tells you this recovery is broad and you need to respect this. This could be the bottom of the sell-off. Another sign that there may be real trouble on the horizon is that Gold is selling well. Against all of the above let’s look at some fundamentals. China continues to slow down, global shipping is in a major stall with more container ships at the dock than in any time in modern history. The only bright spot is U.S. employment but that is mostly growing in low paying service jobs. We have a mess in the Middle East with a belligerent and emboldened Russia supporting the Assad regime. U.S. corporate earnings are week and the PE ratio of the market is high. 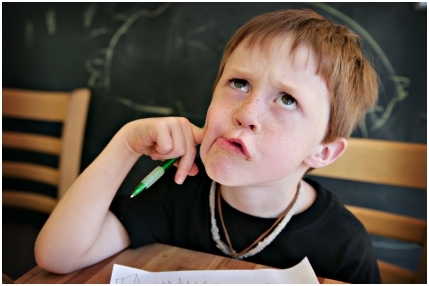 BUT I am ready with my figure on the button to change my long short ratio. I am still a bear but if SPY can test and hold above 2030 I will need to say this is over for a while, I am convinced 2016 will be a major sell off and I expect it now or in May. 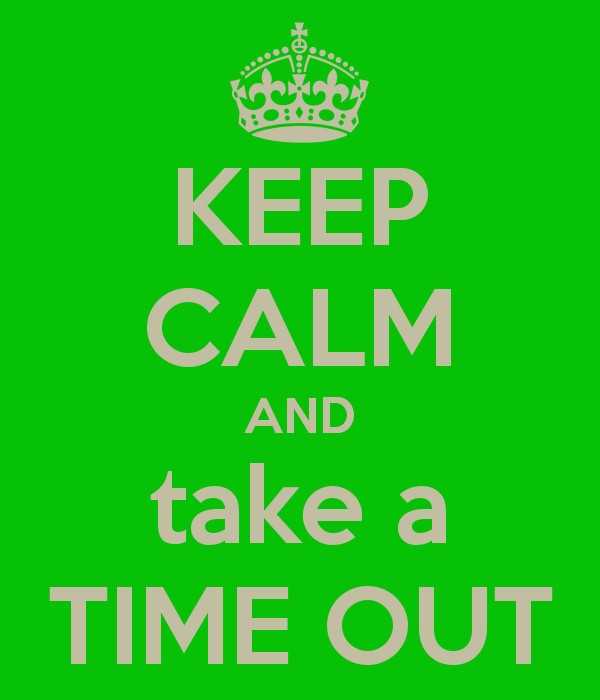 For the investors on the simple plan just go to cash. In uncertainty you do not need to participate.